Olde Porterfield Gift Shoppe Fiber Optic Banner with Remote // Thomas Kinkade Winter Olde Porterfield Gift Shoppe Fiber Optic Lit Wall Hanging. This beautiful piece measures 36 by 26 inches and is sure to make a wonderful gift! 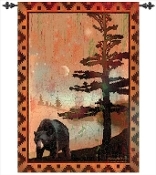 Size:36" x 26" Includes Remote Beautiful scenery is brought to light with colorful fiber optics. This Winter bring charm and fun to your home with a light-up tapestry. Thomas Kinkade The Garden Of Hope Tapestry is an all cotton masterpiece that measures a large 26 x 36 inches, and is proudly made in the USA. Beautiful scenery is brought to light with colorful fiber optics. This Winter bring charm and fun to your home with a light-up tapestry. From the mountains of North Carolina, manual WW weaves, sews, prints, and develops not just the fabrics, textiles, and beautiful products you'd expect from a Heritage company, they bring you the freshest designs for your home. Beautiful scenery is brought to light with colorful fiber optics. This Winter bring charm and fun to your home with a light-up tapestry. 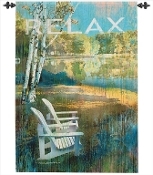 Thomas Kinkade A Peaceful Retreat Cotton Tapestry is an all cotton masterpiece that measures a large 36 x 27 inches, and is proudly made in the USA. 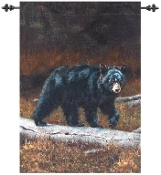 Thomas Kinkade Home Coming Hero Tapestry is an all cotton masterpiece that measures a large 36 x 27 inches, and made in the USA. 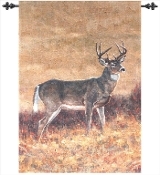 This Tapestry makes for a great decoration for your home, office, excellent to hang on wall, fold on bed, etc. Thomas Kinkade The Garden Of Hope Tapestry is an all cotton masterpiece that measures a large 26 x 36 inches, and is proudly made in the USA. Thomas Kinkade The Light of Peace Cotton Tapestry is an all cotton masterpiece that measures a large 46 x 67 inches, and is proudly made in the USA. 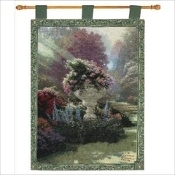 Thomas Kinkade Victorian Garden Tapestry is an all cotton masterpiece that measures a large 36 x 27 inches, and is proudly made in the USA. Boardgames Tapestry Throw Boardgames design by Manual Woodworkers and Weavers. 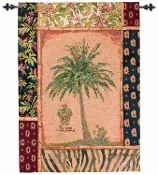 This tapestry throw is large and a fitting decoration for any home. Made of cotton, comes with metal hanging rod. Features the games Checkers, Backgammon, Parcheesi... Tapestry throws are functional, decorative, and will be sure to add elegant decor to any room. 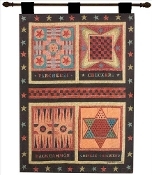 Field of Dreams Wall Hanging Beautiful rustic design by Manual Woodworkers and Weavers. Great for any home decor with a western theme to it or for anyone who loves the outdoors. - Cotton - Woven wall art with included hanging rod - Hanging... Giftcraft Set of 3 Beach Lovers Wooden Wall Signs Great Gift for any Beach Lover can be given as a Set or Three Great Individual Gifts!